Alliance of Valiant Arms (A.V.A) provides heart-pumping fragging action in an Unreal Engine 3-based free FPS. 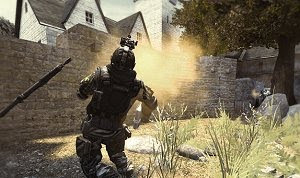 The modern warfare experience promises multi-player online gaming and twitch-based fast action first-person shooter (FPS) action, resulting in visceral, intense combat unlike any other. In A.V.A, war has broken out in modern Europe between the European Union (EU) and the Neo Russian Federation (NRF). Tensions run high as the two factions square up for unprecedented blood-and-guts urban warfare. Are your senses keen and your trigger finger primed and ready to take on your enemy in a dense and dirty urban jungle? Create a character, connect with your friends and clan online and jump into the heat of modern warfare in Alliance of Valiant Arms!